In this instance Disclosure refers to the formal acknowledgement by world governments of an extraterrestrial presence engaging the human race, but could well refer to a long list of concerns the truths of which still lie behind walls of secrecy. The purpose of World Disclosure Day (WDD) is to provide a focal point for people and organizations to come together to assert their right to know and demand cosmic truths being withheld from them by their governments. 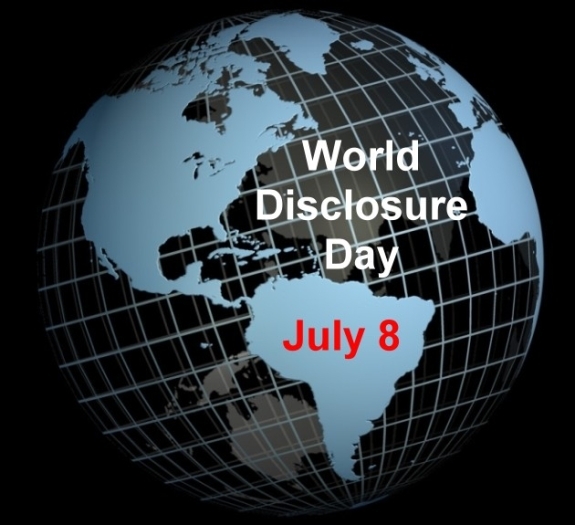 World Disclosure Day also helps broaden public awareness of the Disclosure process and those organizations advocating for the truth on behalf of all citizens. Since 2001, July 2 has been designated as World UFO Day. This date was chosen as it was a suggested candidate for the Roswell crash event. However, the era of the UFO is long over, and now we are in the era of exopolitics - the political engagement of the past, present and future of extraterrestrial related phenomena. WDD thus completes the historical symmetry with these two dates bracketing the annual festival celebrated in Roswell, New Mexico in early July. There is considerable material on the Internet regarding the Disclosure truth movement. Search on "disclosure" and "exopolitics" or "UFO" together. Note: The concept for a WDD in this context was originally put forward by Steve Beckow and Geoffrey West in August of 2010.